A big part of the Next Chapter in the Sabres rebuild has to do with prospects not named Jack Eichel, Sam Reinhart and Rasmus Ristolainen. 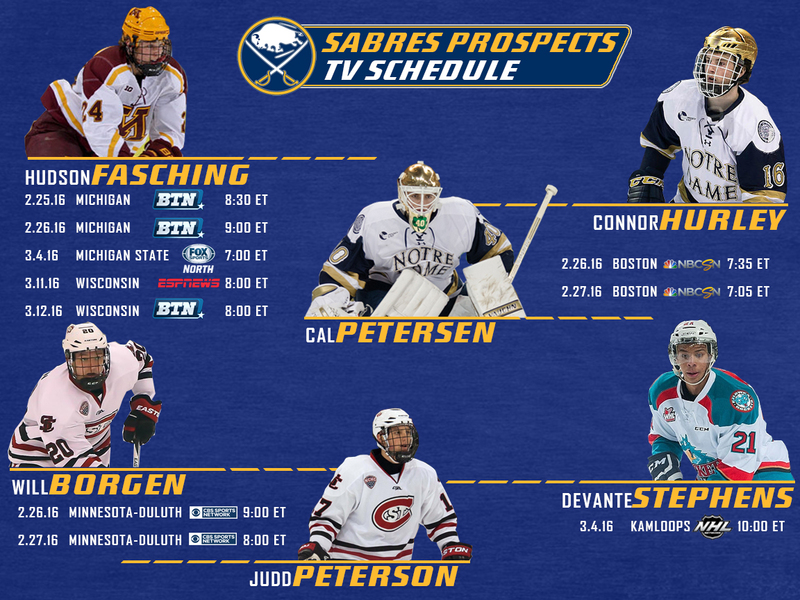 A handful of Sabres prospects who are at various stages of their development will be on national television over the following weeks and we wanted to provide you with a graphic for easy tracking of the 10 games that are coming up. Access to each of the networks listed may vary based on your cable provider and the package you receive, so double check to see which channels you’re able to watch. However, you can catch Hudson Fasching, Cal Petersen, Connor Hurley, Will Borgen, Judd Peterson and Devante Stephens over three separate weekends between the end of February and March. You won’t have to worry about picking between the Sabres and these prospects much either. The big club has a pair of west coast starts on February 26 and 27 and Buffalo’s matinee start on March 4 means you can tune into catch Minnesota and then Kelowna later that night. You will, however, need to choose which prospect or prospects you want to watch as the college games do happen to overlap on the 26 and 27. Fasching may be of particular interest to Sabres fans as the Gophers are currently a bubble team for the NCAA tournament and should his season end early, Tim Murray could take the opportunity to sign him to his entry level contract with the promise of immediate NHL playing time as extra incentive. Depending on the timing, Fasching could suit up for as many as 13 games between Buffalo and Rochester. We’ll make sure to share this graphic a few times over the coming weeks via Twitter as a reminder of the upcoming games.